Contargo supports the student competition “Logistik Masters” for the first time. Container logistics hinterland network Contargo is taking active measures against future shortages of skilled personnel and over-ageing of the workforce structure by engaging in cooperation with students and universities. This year for the first time the enterprise is supporting the “Logistik Masters” student competition organised by German weekly transport and logistics magazine VerkehrsRundschau. The student competition Logistik Masters is one of many projects Contargo uses as an opportunity to recruit young talent. For instance, the enterprise presents itself at business networking events like “Bonding” in Karlsruhe. In order to find suitable personnel many Contargo locations cooperate with universities in their region. Employees go to the universities, or student groups visit the containers terminals. Contargo regularly co-supervises bachelor and master theses from a wide range of disciplines. The company also frequently engages in individual projects; for example this year the project “TRANSFER TOGETHER – BNE / Climate Change Education” with Heidelbrg University of Education (PH Heidelberg). 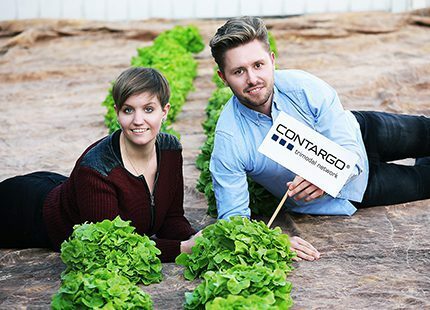 As well as students, Contargo makes contact with young people who are still at school, because it intends to successively increase the proportion of trainees in the workforce from the present five percent to ten percent. Contargo provides training for the following qualifications: commercial specialist for forwarding and logistics, construction mechanic, machine and plant operator, warehouse logistics specialist and specialist for port logistics. Contargo also regularly offers students places for a dual study course in logistics. Young recruits are soon assigned their own projects, in which they can prove their abilities. In this way they are prepared for management posts – which Contargo prefers to appoint from its own ranks. With an annual transport volume of 2 million TEU, Contargo is one of the largest container logistics networks in Europe. Contargo integrates container transport between the western seaports, the German North Sea ports and the European hinterland. The enterprise has 24 container terminals at its disposal in Germany, France and Switzerland and maintains offices at seven additional locations in Germany, the Netherlands and Belgium. Contargo also operates its own barge and rail lines.